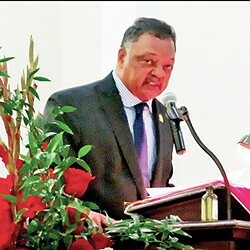 Jesse Jackson was in Memphis this past weekend, rekindling memories of a mission — political as much as religious — still in need of fulfillment. On Sunday, there were appearances at churches and a press conference at Mt. Pisgah C.M.E. Church, where he repeated such sentiments and deplored the idea of “neutrality in a time of crisis.” On Monday, Jackson met with Mayor Jim Strickland, where he made the case for more minority contracting and pronounced himself satisfied with “signs of progress” on the city’s part. At all these places, he maintained — almost dutifully, it seemed at times — the bearing of an icon. He has, after all, been one for most of the nearly 50 years since he first made his presence known in Memphis, as a young associate of Dr. Martin Luther King Jr., as the disciple who made the claim, questioned by numerous observers on the spot but converted into a kind of metaphorical truth by Jackson’s subsequent career, that he had cradled the bloody head of the martyr on that cruel April day in 1968 when King was assassinated at the Lorraine Motel. In 1991, when former Memphis schools superintendent Willie Herenton was in the stretch drive of his historic race for mayor, it was Jackson who appeared on his behalf at the rostrum of a climactic rally, and it was Jackson, too, who, in the aftermath of Herenton’s victory, would come to Clayborn Temple for a celebration, giving that edifice its last great moment before its collapse into a delapitude that is just now being answered by a faithful restoration (See Viewpoint, p. 11). And whom? That Al Sharpton is the closest thing to an answer is merely a way of saying that Jackson has still not been entirely replaced as a spokesman for his people or as a conscience of their cause. Jackson was just then at his zenith politically. In the end, however, he did not have the aforementioned “budget” nor the connections in high places that were already beginning to put the erstwhile populist Democratic Party in the same kind of dependency on corporate generosity as the rival Republicans. In that Milwaukee speech, he said, “In America, it’s not about money, it’s about authenticity.” A worthy sentiment, but not quite … on the money. He would lose Wisconsin, albeit narrowly, to Michael Dukakis, and end up finishing second in the primary season overall to the Massachusetts governor, who in turn would lose in November to the GOP’s George Herbert Walker Bush. There have been many ups and downs since then for Jackson. He never lost standing with his African-American base, but he would never again loom as the bridge-building presence that he came near to being in 1988, when he graced a Time magazine cover over the simple phrase “Jesse?” A generation later, Obama, a cooler property of an inspiring but less incendiary and ideological nature, would win the prize that Jackson had sought. Meanwhile, Jesse Jackson was relegated in the media and in most people’s minds to the role of civil rights veteran, an ombudsman of sorts for that cause, a testifier certifying to this or that transgression against the rights of black folks. And, indeed, he can and does speak to that need, as when he said, preaching to the congregation at Mt. Pisgah, that Willie Herenton or Bishop William H. Graves of the CME Church might have been governor of Tennessee but for the habits of racial prejudice. There was room in his message for “the Appalachian coal miners who work two miles down in the dark, who provide the energy for our country … the poor whites who lack health care,” and who had been led to “fight against their own interests” by opposing what was branded as Obamacare. “Obamacare is a name; they tried to poison the book by poisoning the cover,” he said of the opponents of the Affordable Care Act. Jackson disposed of Trump‘s latest ploy to limit legal immigration by noting that Jesus was a “refugee” who spoke no English, and “had no job after 30,” and thus could not qualify under the new immigration plan. “You banish a refugee, you are trying to fight Jesus!” he thundered, and the congregation, delighted, recited the thought along with him. There was more, all of it relevant to the ongoing political dialogue, all of it a reproach to the more tempered and timid voices of the moment, all of it a reminder that Jesse Jackson, with or without honor in his own country, is still a prophet to his time.